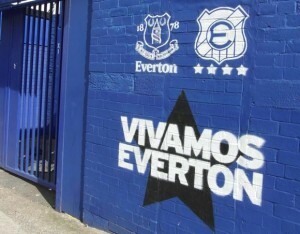 ‘Friday Night And The Gates Are Low’ goes the song by Half Man Half Biscuit, channelling Abba and Tranmere Rovers in an ironic paean to Prenton Park. But in 2017-18, attendances at this 16,500-capacity ground in Birkenhead, just over the Mersey from Liverpool, were a healthy 5,000-plus, easily the best in the National League. And with Tranmere, after promotion in 2018, now challenging for play-off place in League Two, these figures are increasing. And even Friday-night football is a thing of the past – a pre-season friendly with Liverpool attracted 13,000 back in 2016. The year before, Tranmere had lost full league status after 94 years. With Liverpool city centre under ten minutes away by train, bus or taxi, Rovers have always had to compete for support – hence Friday-night fixtures. 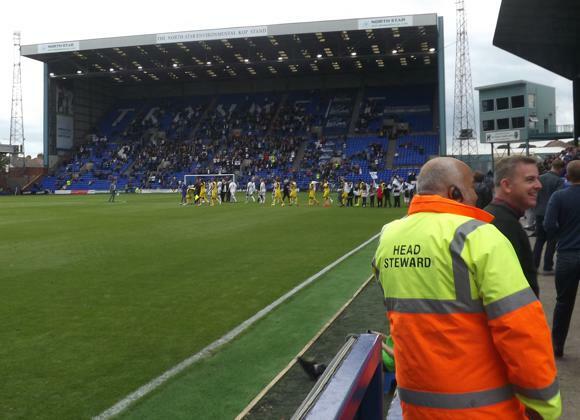 Wearing white to distinguish from the red of Liverpool and blue of Everton, Tranmere have managed to stay afloat, maintaining their strong identity and solid fan base. Tranmere’s foundation year of 1884 refers to when a certain Belmont FC were formed from the football teams of two cricket clubs. 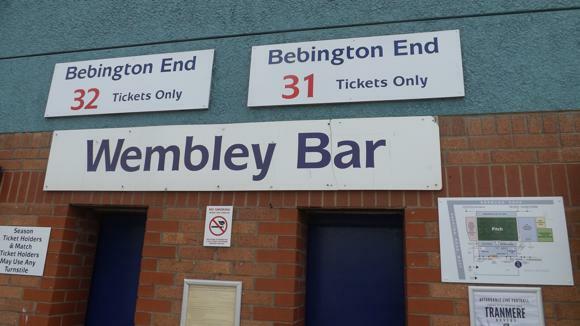 Always based in Birkenhead, blue-shirted Belmont were renamed after the area a year later and Tranmere moved up the local Lancashire leagues. Joining the Lancashire Combination, Tranmere won the title in 1914, two years after setting up on the fringes of suburban Prenton Park at a ground with its own grandstand. The club continued its rise, reaching the Central League, which gave access to the inaugural Third Division North in 1921. It was around this time that Birkenhead spawned a string of record goalscorers, first Dixie Dean, then Pongo Waring, then Bunny Bell. Sold on for a serious profit by Birkenhead-born manager Bert Cooke, they enabled Rovers to finish above local rivals New Brighton almost every year, until promotion in 1938 and a one-season stint in the second. After the war, Rovers continued in the third flight, dropping down to the fourth but coming back up in 1967 with later Derby star Roy McFarland as a young centre-back. By now, Tranmere were playing in their signature white. With former Liverpool icon Ron Yeats as player/manager, and other ex-Anfield stars crossing the Mersey, Tranmere scaled the Third Division table. In his classic centre-back role, the ageing Yeats held back wave after wave of Arsenal attacks at Highbury as Tranmere claimed a famous victory in the League Cup. Also key to Rovers’ success that night were two figures who would have a vital role at the club in decades to come: Ronnie Moore and Mark Palios. Typified by the low gates that Half Man Half Biscuit later sang about, the 1980s saw the club all but go under. Operating as a striker then assistant coach, Moore returned to Tranmere to begin a ten-year stint at Prenton Park. With John King, who originally had taken over from Yeats, as manager, Rovers began to go places. Gaining promotion in 1989, after losing a first play-off final at Wembley, Tranmere beat Bolton 1-0 in extra-time in 1991 to reach the second tier. The scorer that day, Chris Malkin, soon teamed up with a homecoming John Aldridge and Tranmere hit a purple patch. In nearly 300 appearances, former Liverpool star Aldridge hit 174 goals for the Superwhites, taking them to three consecutive play-offs. With ex-Everton star Pat Nevin also on board, Tranmere came within touching distance of top-flight football, and reached the semi-finals of the League Cup in 1994. High-scoring Rovers took Aston Villa to penalties after two late goals from the Premier League side turned the tide in both legs. Subsequent shoot-out defeat came amid play-off disappointment three years running, losing to Swindon, Leicester and Reading. King stayed until 1996 before Aldridge took over as player-manager for five years. 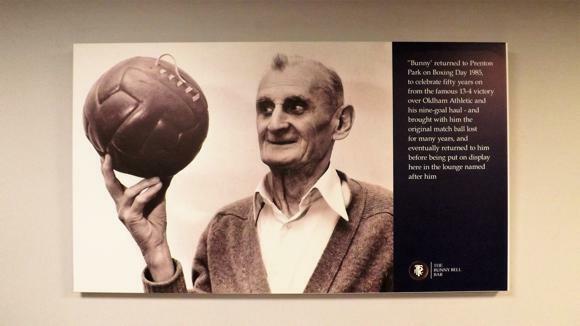 Though never reaching the play-offs, the veteran led Tranmere to their only major final to date, losing 2-1 to Leicester in the League Cup after going down to ten men on the hour. Aldridge’s last hurrah came a year later, a feisty run in the FA Cup featuring an astonishing 3-0 win at Everton, and a four-goal turnaround to beat Southampton 4-3. An emotional quarter-final with Liverpool, Steven Gerrard, Michael Owen and all, ebbed and flowed at 1-2 and 2-3 before a full house at Prenton Park. Despite the 4-2 defeat, goals during the campaign by Steve Yates and Paul Rideout live long in the memory. In the league, Tranmere floundered, dropping down to the third flight and going through a succession of managers. A returning Ronnie Moore took Rovers close to the play-offs but it wasn’t to be. This was around the time that ex-Tranmere midfielder Mark Palios hit the spotlight. After two stints as a player at Prenton Park, Palios moved into football administration and almost single-handedly saved the FA from complete disaster during the Wembley rebuild. After resigning as Chief Executive in 2004, Palios became a regular media commentator then, ten years later, assumed ownership of Tranmere Rovers. Relegated to League Two that same year, Rovers were going through a rapid succession of managers, including Ronnie Moore, suspended by the FA. On the pitch, half the 48 players used in disastrous 2014-15 campaign were the result of loan deals. Between late February and early May, Tranmere managed one win in the league. The final nail came with a 3-2 defeat at Plymouth, ending Tranmere’s 94-year continuous membership of The 92. Palios set to work. First bringing in Gary Brabin as manager, who in turn created a successful strike partnership with Andy Cook and James Norwood, Palios oversaw the Rovers return – eventually. It took the arrival of ex-Tranmere midfielder Micky Mellon before Rovers reached the play-off final in 2017. After a 3-1 defeat by Forest Green Rovers, Tranmere returned to Wembley in 2018, a goal each from the prolific Cook and Norwood helping Rovers overcome a first-minute red card to beat Boreham Wood. 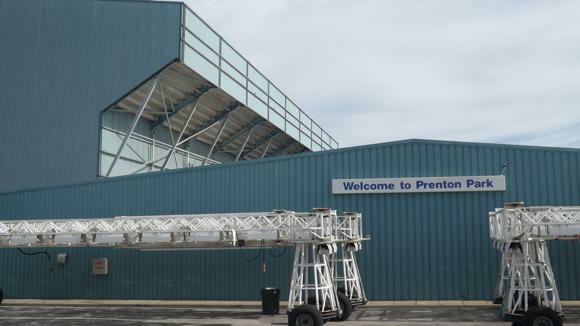 On the edge of the residential district it’s named after, Prenton Park has been Tranmere’s home since 1912. 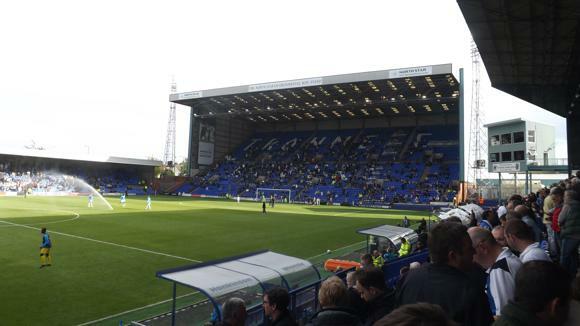 The ground you see today – huge Kop Stand at one end, un-cowshed like Cowshed Stand for away fans at the other, sideline Johnny King Stand named after Tranmere’s legendary manager – all date post-Taylor to 1995. The exception is the Main Stand, with the ticket offices and club shop behind, opened in 1968. The suites within and disabled facilities around the ground were all upgraded in 2015. Capacity is an all-seated 16,500, more than 11,000 taken up by the Kop and Main Stands. 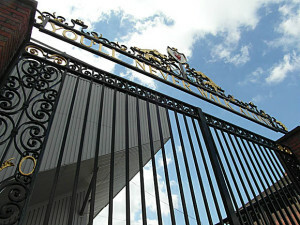 Prenton Park is also used by Liverpool reserve and ladies’ teams. 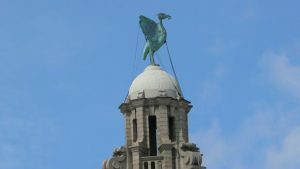 From Liverpool, there’s a choice between a quick train hop over the Mersey by train and a 20-minute walk, or a 15- to 20-minute bus journey all the way. From Liverpool Central or Lime Street, trains https://www.thetrainline.com/ leave every 15min for Rock Ferry (£3.65), journey time 12-14min. From the station, head up Ashley Street, left into Wycliffe Street then right into Bedford Road. After 8-10min, you reach a roundabout – head right into Bebington Road then left, either at Everest Road or at the Sportsmans’ Arms on the corner. It may be easier to get a bus all the way. A short walk from Liverpool Lime Street past St John’s Gardens, buses leave from stop VE on Victoria Street, near the junction with Preston Street. Stagecoach No. 472 (every 20min) takes 20min to reach Prenton, Highgreen Road. The ground is then a 5min walk along Borough Road. Alternatively, from the same stop VE, take Arriva bus 464 (every 30min) to Devonshire Park South Road (journey time 20min) and you’ll see the floodlights ahead to your right, 100 metres away. The sat nav code for Prenton Park is CH42 9PY. Parking at the ground (£5) can be booked through the club’s online ticket facility. 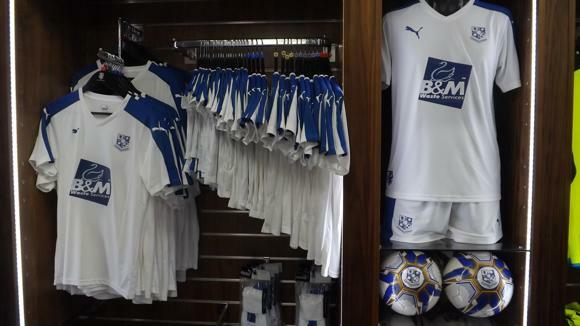 It can also be purchased from the club shop. The car park is behind the Kop Stand, so opposite to the away end. Expect a fairly long delay to exit after the game. 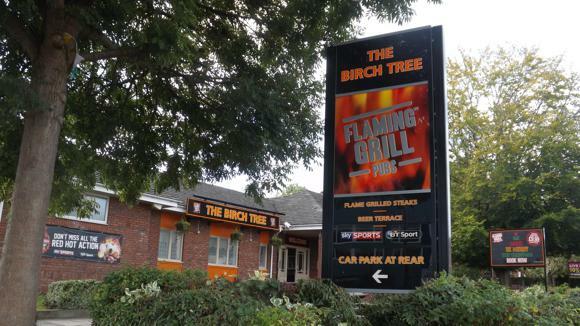 Alternatively, near the away end where Prenton Road West meets Woodchurch Lane, family-friendly pre-match bar/restaurant the Birch Tree (CH42 9PY) offers parking for £5, which you can set against drinks at the bar. Advance tickets are sold from the office (Mon-Fri 9am-5pm, home-match Sat 10am-kick off, away-match Sat 10am-1pm, midweek match days 9am-kick off) behind the Main Stand or online. Cash and major credit cards apart from AmEx are accepted. 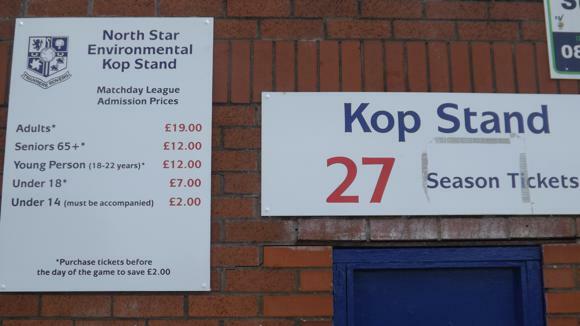 Cash-only turnstiles also operate on match days when there’s a £2 levy for most categories but availability is rarely a problem. Seating is unreserved except for the Main Stand. Admission prices are £21 for the Main Stand (over-65s and 18-22s £14, under-18s £6, accompanied under-12s £5), and £18 (discounts £11, £5 and £2) for the Johnny King Stand and Cowshed Stand away end. In the Main Stand nearest the Cowshed Stand, the Town Paddock costs £19 (discounts £12, £5, £2) and allows easy access to the Bunny Bell Bar. Behind the Main Stand, the Club Store (Mon-Fri 9am-5pm, home-match Sat 10am-kick off & for 30min after final whistle, away-match Sat 10am-1pm, midweek match days 9am-kick off & for 30min after final whistle) offers replica shirts (for 2018-19, white with a blue fade), and dark-blue away tops. Souvenirs include ‘Back Where We Belong’, Matt Jones’ recently published saga of Tranmere’s Football League return after three seasons out. Look out, too, for Subbuteo-style T-shirts depicting the line-ups when Tranmere beat Everton 3-0 in the FA Cup in 2001. 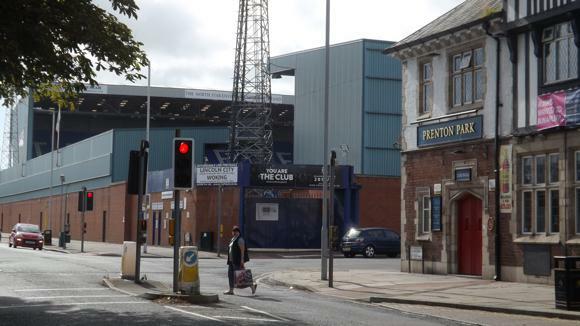 The main pre-match drinking spot is the historic-looking Prenton Park Hotel, on the corner of Borough Road and Prenton Road West by the away end. Home and visiting supporters tend to mingle in this traditional hostelry. Past the other end of the Cowshed Stand, by the junction with Woodchurch Lane, the Birch Tree is a family-friendly choice with a full menu. The only other alternative for away fans is the large, communal Sportsmans Arms, offering standard beers and TV sport where Prenton Road East meets Greenway Road, 5-7min from the away end. 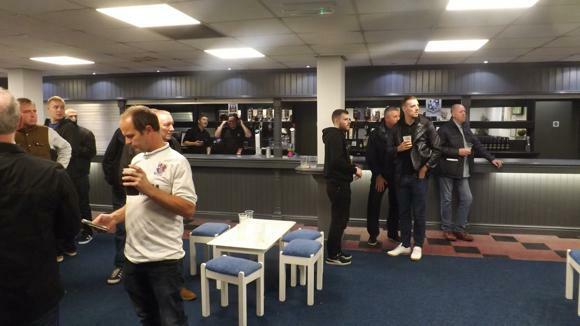 Two match-day outlets operate at the ground: the Bunny Bell Bar alongside the Town Paddock and Town End in the Main Stand (pre-match and half-time) and Aldo’s behind the Kop Stand (half-time and post-match).